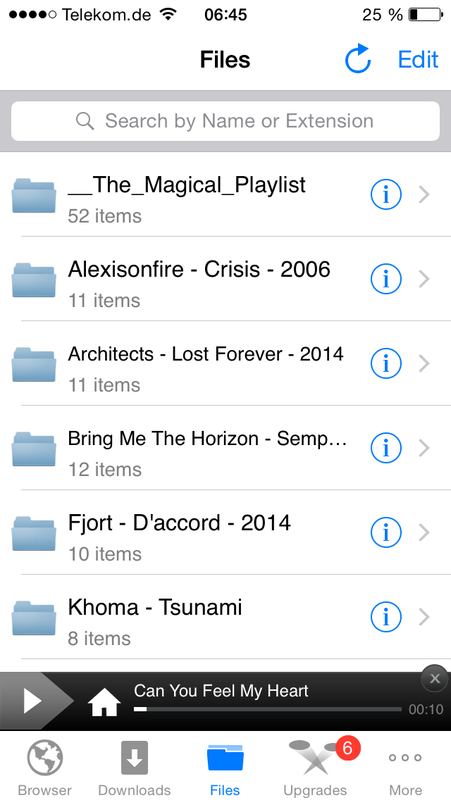 If you don´t want to use iTunes for copying and playing music on your iOS device (in my case an iPhone 5) you don´t have a lot of alternatives. Most of the apps that also work with not jailbroken iOS devices are crap. For a very long time I used Phone Drive. It´s a pretty good app, allowing you to copy files via wifi to your device using simple webpage uploader or via ftp. 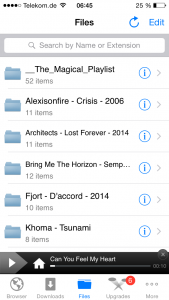 Especially the ftp feature is great if you want to copy directories or a lot of music. Sadly the app doesn´t support UTF-8 unicode which leads to some strange characters and can cause upload problems when using ftp. But the BIGGEST FLAW was that it frequently stopped music playback when you locked your device. I reported this bug to the developers but a) got no answer and b) it wasn´t resolved though the app got updated regularly. So I went on to search for a replacement and the one I found looked pretty crappy too. At least in the beginning. 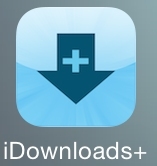 The replacement is called iDownloads+ and was mainly designed for downloading files from webpages to your iOS device. Therefore it features an internal browser with ad-block support and several features helping you download the web easily. But it can also play music and for me the most important part – you can copy music to your iOS device without using iTunes. There a 2 ways to do that: first you can use a browser which I really can´t recommend because you can only upload one file per upload and you can´t create folders. Second you can use WebDav and I highly recommend that. WebDav is a bit like ftp so it allows you to create, delete, rename and move files & folders, upload several files & folders at once and a lot more. Most operating systems have a build in WebDav support but if you´re a Windows user like me I recommend to use a third party tool (because the WebDav integration even in Windows 8.1 is crap). I use CarotDAV. It´s free, it´s small, it can be portable and does the job. Sadly the WebDav feature isn´t available in the free version. You have to pay 0,99 EUR (around 1.20 $) to unlock it and I highly recommend that you also spend a bit more to remove all ads from the app. Otherwise it´s flooded with ads.